- Last day is Monday April 9th (11:59:59pm Pacific Daylight Time), 2012. - If you can beat any of the high scores from the previous competitions, you can submit your score to the BYOAC High Game Scoreboard. I shortened this competition 1 day so that we are closer to the normal Sunday finish. I used to drop a good bit of quarters into this game at the arcade! There is no normal sunday finish. People aren't necessarily consistent enough to start new comps, or even keep up with old ones, to follow a schedule. This also allows for 'incidents' that might come up. I don't know why they couldn't make this game 8-way. But it's a pretty fun game. Here's a starter score. heres my first entry...only played bout 10 games so far, i like that this game saves my scores. I have too many that dont..guess now knowing ill put my actual initials in lol..
was dissapointed to find completing the log challenge only gives a 1k bonus.... the 3rd log is half the size!! lol i lasted 5 seconds. great pick kixfan,,ive seen it a few times whilst looking for choices but never tried it out. i foresee us hitting the 300k range by next week..
Downright relaxing compared to Tapper! 3 games: 60k, 64k, 69k. Yah, you get only 1k for completing the bonus round, but you get about 3k during it, so it's not bad. I already built my own arcade controls! 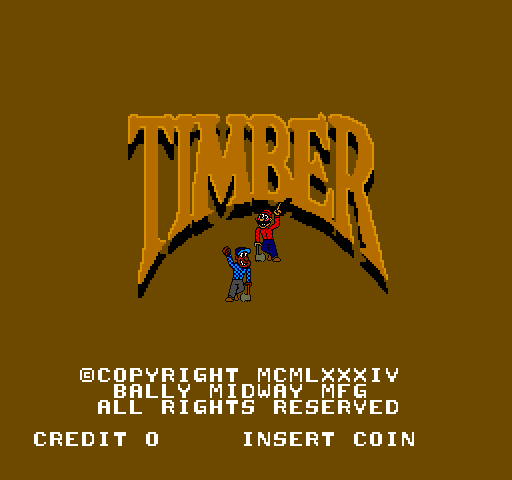 So the lumberjack does some moon lighting as a bar tender in Tapper? Not sure exactly why I like this game so much. It's very relaxing killing nature until you realize you have 10 seconds left and 3 trees left! Hopefully the bird doesn't become extinct. i dont think level 8 is beatable..ive gotten to the last tree several times but its always put in a spot atleast 2-3 seconds away with never more then 2 or 3 seconds to spare..that said i believe its only possible to get a max of 15 or 20k higher then this score as i made one mistake and died by beehive 20 seconds before time up..so i lost those potential points by having one more full round chance on lvl 8.. I got up through level five before dying, but then lost them quick. 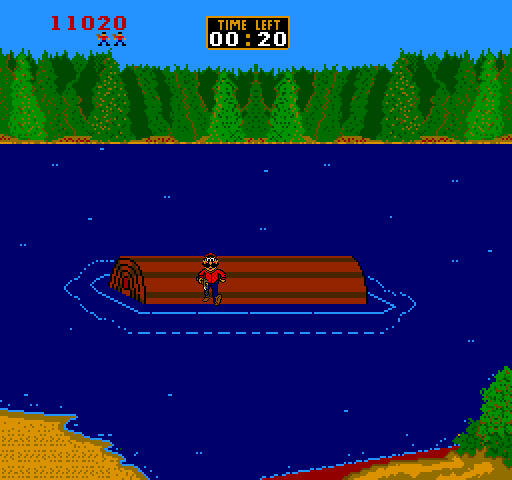 Got the first two log runs, almost splashing in, and splashing in, just after the clock ran out. Not worth the effort, point-wise, but I wanted to see whether I could do it. I don't see how people are getting such high scores. I hit a majority of the beehives, and got at least half the turkeys. A better one. I had one tree left on 7 ! I still don't see how people are getting such high scores, unless they're getting to level 7 or 8 on their first dude. unless they're getting to level 7 or 8 on their first dude. 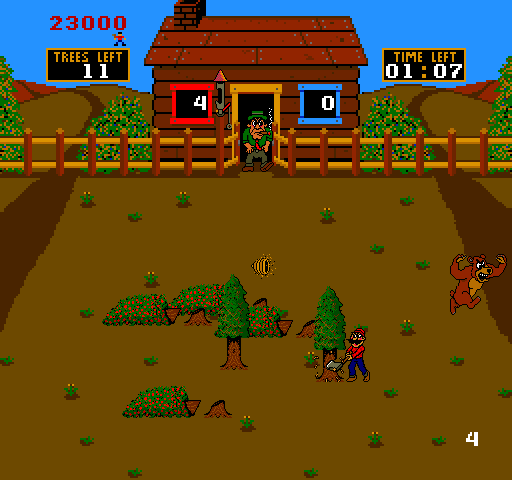 Timber as marathonable, so level 8 must be passable. The TG record on the arcade version is over 6 million. You can get past level 8. I got to 11, and just missed finishing it by 1 chop. I think I had at most 2 seconds at the end of each of those rounds. Out of curiosity, how is everyone playing this? I only have 1 joystick (centered) with 2 buttons on each side for left or right handed play. So I use 2 buttons to chop with. I think if I were to use a joystick, it would be a disadvantage. Anyone using 2 joysticks? Nice! Did not realize that. Will try this later. In regard to only getting 1k for completing bonus log round. You do get points for each second you stay on the log. When I completed the first bonus round I got a little over 4k total. Also, I don't know about everyone else but for awhile I was trying to hit each beehive to get the 500 points but was getting smacked with too many beehives! The game seems to have an issue with moving and swinging axe at the same time. 123,585, and that's probably the best I can do. Got several 5k bonuses. Hit lots of beehives. Anybody else is having a problem with WolfMAME 106. The speed is twice as fast! I knew there would be some kind of easter egg bonus. However, I was looking at the trees and thought a strategy of 'anything off center should go down that way, and then I looked at my screenshots and found I was already doing that mostly. With bee hives, I was chopping till about the last second, and then moving just right to get it, so I don't think I was losing time. Otherwise, I'd just skip it. If the speed is faster in older MAME.....well, what is your score with current/recent MAME? I'm using .139 to play it's at normal speed. I have 106 at the office and it's working at normal speed. I think the idea of getting a bunch of 5k bonuses for all the trees in one direction kind of messed up my game play. I gave up on that approach and was able to get this. Might of been a little closer but got stung during my last round. Yeah, I managed to do it twice in a game, and still came in 15k under my last score. In the process of that, I was still getting better times than my last, so I'm going to go back to just chopping like you have. .....well, I think I've reached my limit. I got 114k again, and that was pushing it. Finally got past 14. I was one tree away from 17. It looks like there is 6-8 different tree patterns. It doesn't look like it gets any harder then it already is, considering what the TG high score is. great scores! 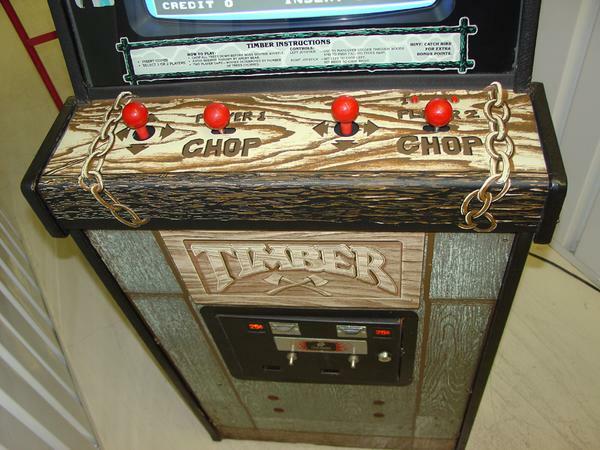 im spent on this one..
Just for laughs, I set up joystick #2 on my cab to do the axe. It felt more natural. There are actually 5 different tree paterns. I took some screenshoot to help me find some sort of path to follow... not easy, except for the one that goes from corner to corner and the one I called verticals. I try to post some pics next week. This game is absolultly marathonable. The High score is 6 Million by Don Duwelius. That's how I do it too on may cab and that's actually how the real arcade control panel is setup. 3 life first bonus at 20k and every 60k + difficulty level 3 is the default setting and the one use on TwinGalaxies. That's the settings I'm also using. What am I doing wrong, when I hit 'F3" it just reboots the game. I can't seem to get this diagnostic screen to show up. To go back to the game do the same thing. Yeah, F2 is service mode in MAME. Most, or all, of the Williams and Bally Midway games require entering service mode to change settings, I'm guessing because they didn't have dip switches. They was more new-fangled den dat. Thought I'd take a few more swings with the ax but can't better my score. My choice is lady bug.